Lotus root (renkon in Japanese) is actually the rhizome of the lotus plant. It's a popular vegetable throughout southern and eastern Asia, but it's still not that well known in the west. Lotus root is full of fiber and various vitamins and other nutrients. In Asia it's believed to have various medicinal qualities, but in macro-nutrient terms it's best to think of it as a starchy vegetable, like potato. Visually of course, it's very appealing with all those little holes. Here I'll explain how it's prepared and eaten in Japan. First off, this is how a raw lotus root looks like. You can buy them at an Asian (South or Eastern) grocery store. More often than not they will be vacuum packed. A nice fresh one is a light orangey-brown. The older the root the browner and darker it is. Mature lotus root has a sort of slightly bitter or tannic quality, so should not be eaten raw. (Apparently young lotus roots can be eaten raw, but I've never encountered them unfortunately.) The bitter/tannic substance is most concentrated in the skin, so you should peel it. Inside, it's a light flesh color. Raw lotus root will start to darken almost right away, rather like raw potato. 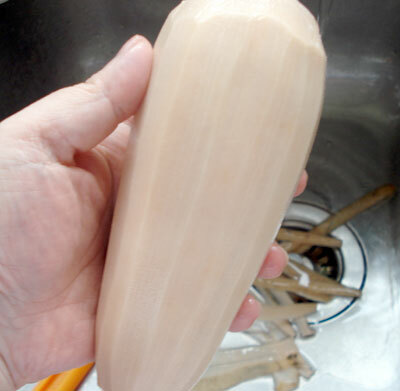 To prevent this, put the peeled lotus root in water with a little vinegar in it. If I slice it up, I put the slices in the vinegar water. If using the slices for a salad, or for any dish that has no further or very little more cooking, they should be boiled for a couple of minutes in vinegared water. This retains the crunchy texture but gets rid of that tannic-ness. Depending on how long it's cooked, the texture of lotus root varies from crunchy to very starchy and a little sticky. I like it either way. Here are two ways of using lotus root in its crunchy stage. Put the sliced lotus root into vinegar water as you slice it, as described above. Bring a pot of water to a boil, and add a little vinegar. Boil the lotus root for a couple of minutes. Drain and cool under running water; drain well. Mix the vegetables and seasonings except the mayonnaise together well with your hands, scrunching them a bit to let the flavors penetrate. Add the mayonnaise and ham and mix well. Serve immediately, or cool in the refrigerator until dinner time. 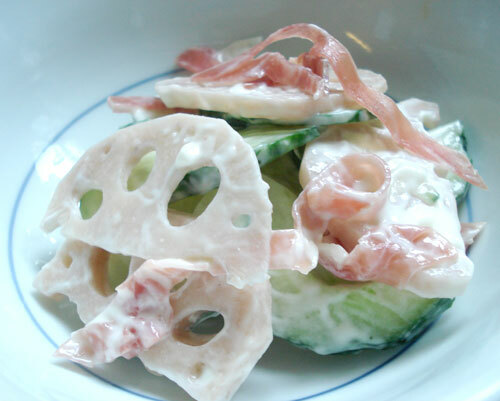 Put the sliced lotus root into vinegar water as you slice it, as described above. Drain well just before cooking. Heat up a large frying pan with the oil. Add ginger and garlic, and stir fry until the oil is very fragrant. Add the drained lotus root slices in a single layer. Cook until the lotus root slices start to change color - they turn a bit translucent looking. Turn over and cook a couple more minutes. Add the chili pepper and green onions, and stir-fry. Add the sesame seeds, pepper, soy sauce and sesame oil. The lotus roots should get a bit caramelized from the soy sauce. Serve hot or cold. This is very nice for bento. Lotus root mini-cakes with sweet chili sauce. This uses the starchy, sticky quality of grated cooked lotus root. Submitted by maki on 2009-02-02 11:53. I always order lotus root dishes in Chinese restaurants but had no idea how to prepare it. Your photos look great! Thank you specially for that complete article. I know have a global view of that veggie and will give it another try. The stir fry looks terrible! I think you'll find that it is US English. In the 1980s, people tried to be more like Americans and tried introducing opposite meanings so that they could be 'cool' but it only keeps going in the youth culture as each generation becomes teenagers and thinks that they have invented it an all of the previous generations are too old to be using such terms. BTW, I've used dried lotus (from the local Chinese supermarket) and rehydrated it for this. I'm Chinese, so the lotus root features more predominantly in things like soups - one very common one is a combination of pork bones and sliced lotus root, brought to a gentle, rolling boil and left to slowly simmer for a few hours, bringing out both the goodness of the pork and turning the lotus root slices somewhat al dente. Very delish, I must add. I've been thinking of using renkon in oden, in addition to daikon, konnyaku and the likes, but then you'd probably have to simmer it for quite a long time (even longer than the daikon!) to get it soft and really flavoured. Could it be a seasonal thing? I haven't seen fresh renkon until this spring. Oden seems like a winter dish. Potatoes store really long, so they are available year round. Lotus root, growing in the mud under water seem as though they'd be difficult to get in the winter, and unless they're processed they don't keep long. Actually, i think lotus root is considered to be a winter vegetable in Japan anyway (not sure about China etc)...and it does turn up in winter stews (nimono). My guess is it's 1. habit/tradition and 2. texture. Can not add much to above but to thank you for your simple recipes! Looks delicious! I see often the slices filled with minced shrimp and then fried. Tasty and decorative as well. Maki, sometimes, the root is a little dark inside. You cannot see it from the outside when you buy it. Any ideas, how (if?) to improve it? tanja, I just try to select the healthiest-looking ones that are lighter in color outside (fleshy-brown-pink), and if there are dark spots I just cut them out. It is a bit difficult to tell from the outside though, that is very true. Gah!! I wish I could find lotus roots in Bern! Maki, you're so lucky in Zürich... I've got cravings for lotus root soup now. And I'm dying to try the lotus roots mini cakes! I take that back. I spoke too soon about not finding fresh lotus roots in Bern. For months now all I've been able to get are frozen, pickled or dried (ugh!) lotus roots. But TODAY I went to my local Asian grocers and they had new stock in (it was a mess, Styrofoam boxes everywhere, could barely walk) and I spied among the fresh veges still in the boxes, packets of fresh lotus roots! Only 4 though, maybe I was simply never fast enough to get to them before someone else did! happiness ^__^♥ Gonna try them mini cakes woo hoo! I made this last night, the lotus root stir fry that is. I didn't use green onions but substituted it with chinese chives instead. It was very tasty. Hubby who is not fond of lotus roots at all decided to take a bite. He was pleasantly surprised and said it tasted very good. He says he will eat this again when I make it again. Thanks for sharing another great recipe! this recipes is really good, i just try it and love it . never know that lotus root can be this good. I've been wanting to make this salad since I saw it here. Mmm Lotus root. I finally had the chance, and I made some additions. I've posted my changes on my blog, along with a link back and a quote from your recipe, I hope you don't mind. Your site always gives me tasty ideas, it's one of my favorite reads. Thanks for all you share! I just bought some from Japan Centre and didn't know what to do with them - your post was #1 on the google search! Thank you!! Once I open it how long will it last? How should I store what is not used right away? You should try to use up the packet once opened as soon as possible. Just store it covered in the refrigerator. But yeah...use it up ASAP when it's opened. I discovered this post actually through the photo which appeared on a search...though now I'm curious to try it after reading what you've said! But, what does it taste 'like'? 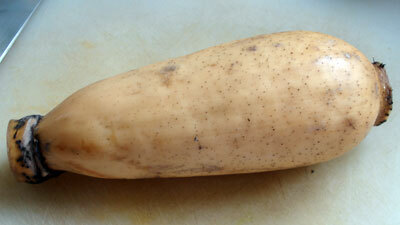 You'd said 'regard as starchy vegetable' is it like a zucchini in flavor or other squash-type thing? Can it be compared to anything slightly less extoic so one who wants to try it may know what they're letting in for? If it is prepped as above to get rid of any bitterness, it has a very neutral flavor. It's more about the texture (crunchy when lightly cooked, or sticky/starchy when grated or cooked a long time) rather than flavor. It takes on the flavors of whatever is cooked with/in/on it. What a beautiful vegetable! Thank you for the education and recipes, I hope I can find it somewhere! It's not zero-calorie, since it has a fair amount of starch and some protein too, but it is high in fiber so it could be used in a weight loss plan for that sense of fullness (not to mention keeping you know, the plumbing moving things along!) 100g (about 3 ox) of cooked lotus root has about 66 calories, 16g carbohydrates, 1.5g protein, 3.1g fiber. I treat it as a carb component of meals generally. I love renkon! I've never seen them here whole, can only buy them packaged sliced in vinegar, or frozen. I must get some soon to try your recipes. I've made the baked lotus chip recipe on jugalbandi a couple of times - it's great as long as they're eaten fresh out of the oven. (I went a little heavy on the cayenne one time and made my friends sweat!) Next time will be the stir fry. I love your site - it helps me figure out what to do with all the random things I can't help buying from Japanese grocery stores! Thanks for the great article! Living in south-central China, lotus is a specialty of the area, and I'm so happy to get more suggestions on how to cook it. BTW, here in China lotus is a summer vegetable, not a winter one. But my Japanese-American husband seems to remember his mom including lotus in oden when he was little. Anyway, another way to fix it is to make a kinpira. A Japanese friend suggested this, so I just used your recipe for kinpira gobo, and wow! came out great. Just returned from 3 weeks in China where we ate lotus root numerous times, usually stir fried, always absolutely delicious. Don't know where I'll find it in Israel where I live, but I'll look in specialty stores. Thank you for all the information and recipes. I ate the fried lotus root at my host family's and fell immediately in love, you have no idea how thankful I am for you sharing this (and the whole site of course)! Oh man, the lotus stir fry is so delicious. How long does it last in the fridge? I'm trying to decide just how big a batch I can get away with making next time! I am young,but i would love to cook with natural Asian-found food like lotus root or bamboo shoots.The only problem is,I do not know what lotus root tastes like because i have never cooked with it before,or even tried it.If you could leave a brief description on the taste please,that would be very helpful.Thank you for the recipes and happy cooking! I've described the taste already in this reply. lotus rhizome(lotus root) is a good vegitable, in Sindh (pakistan) its called as a "BEEHU" very famous serving in wedding meal. its cooked with lot of vegitable like spinach and mutton. Made the whole lot with the green onion recipe and no togarashi for the kids. My husband got one taste, I put a little away for the bento tomorrow and the 6 year old kindergartener proceeded to eat the entire bowl while i was preparing dinner. Guess it was pretty good. I've promised to buy more renkon for the rest of the family tomorrow. I bought a lotus root from my local market in Tian Jin, China. Admittedly, my Chinese is poor, but when I asked the vendor if I had to peel the skin, he said, "No." So I didn't. I put the lotus slices in a wok full of boiling water, which proceeded to turn an evil shade of purple, causing me no small amount of distress. For some reason I could not find anyone else who had this experience on google, or maybe just one guy, but that wasn't encouraging, so I went to Baidu, and used my Chinese language skills to find a few other people commenting about this, and some experts who said I was not poisoning myself by eating the evil purple brew that had unexpectedly appeared in my wok. I also read that the peels contained the most..uh...purple-making stuff, and that you should put the sliced roots in vinegar, as this article suggests. So the next night, I used a potato peeler to slice away the peel (which, by the way, tasted fine the night before)and put the slices in a vinegar/water solution for about 5 minutes. But even after this, I got the same purple brew! What gives? Surely someone has used lotus root as a dye somewhere, but I can't find that either. 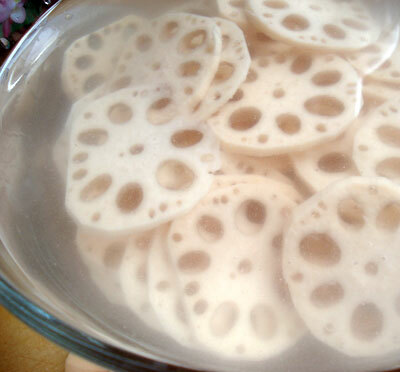 I remember my mother used to stuff sweet rice in the holes and steam the lotus root for mucho hours. Then she would slice it up and sprinkle sugar and serve. That was such a treat! yum! I would like to try it but cook/steam them in the microwave in a bowl with water and loosely covered. Do you think this will work, Maki? Renkon makes for my favorite tempura item, followed by maitake. I like 'em both dipped in a little salt (sometimes maccha or ume flavored), rather than tempura tsuyu. I like 'em even more than shrimp tempura! I love renkon tempura. I can take or leave shrimp tempura actually ^_^ I think my favorite tempura is kabocha squash. Or shiso. 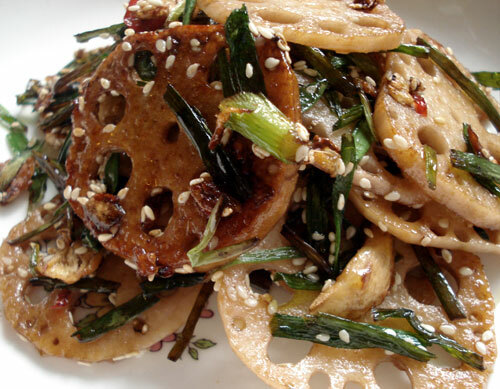 I made the stir fried lotus root with sesame & green onions tonite and it was delish! I've never had it before but since my husband received it as a gift from a friend of his I had to learn how to serve it. Yours was the first site that popped up and the recipe looked easy enough so I tried it. I'm glad I did!!! This recipe is a keeper! Thank you for posting it along with the instructions on how to handle and prep the root itself. The Lotus Root and Green Onion recipe is incredible! I now have to bring it to every pot luck I attend, and it disappears within the first 15 minutes. It is not a snap to make but definitely worth the trouble! HINT: I put extra chili peppers on the side for those who like it really spicy. Great recipe, Thanks for the delicious recipe! t is similar to dishes I ate in Mainland China. I like to use renkon as a replacement for potatoes in my curry dishes.